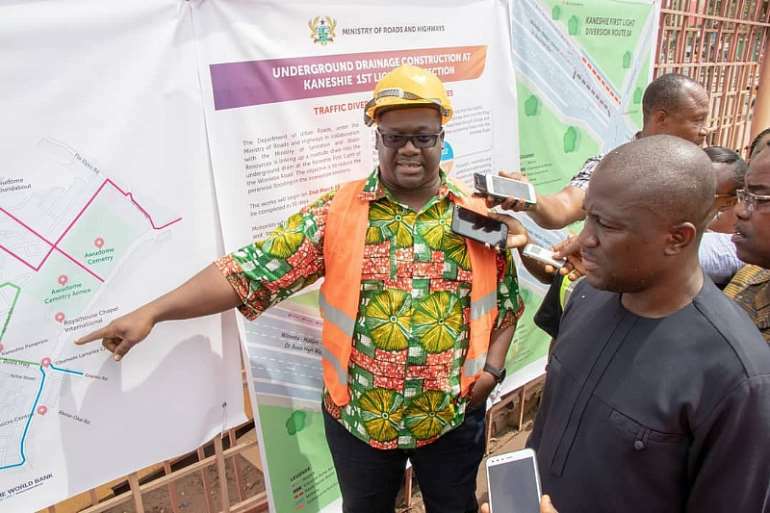 Some portions of the Kaneshie Winneba road will be closed to motorists to allow work for the construction of underground drainage at the Kaneshie first light intersection. 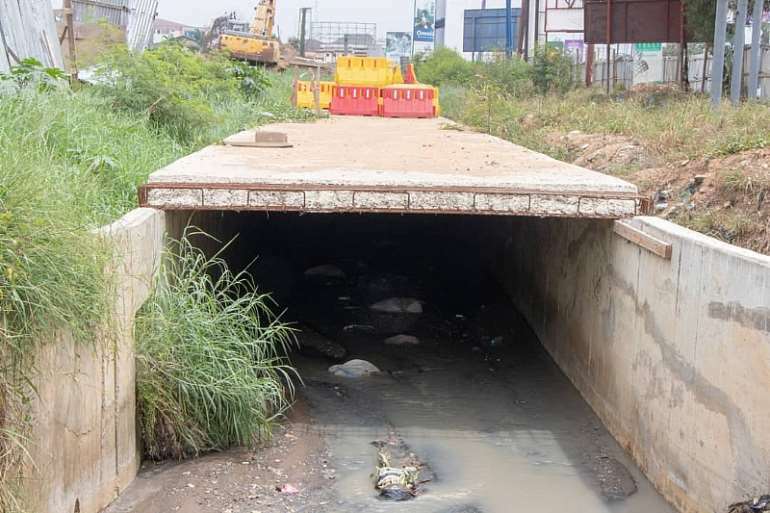 The Department of Urban Roads under the Ministry of Roads and Highways in collaboration with the Ministry of Sanitation and Water Resources say this will help reduce the perennial flooding at the Kaneshie first light and the immediate environs. The Gh₵7million project which is funded by the World Bank will link the roadside drain into the underground drain to address the spillage. The construction of the 600meter drainage by Vuluss Construction Company will begin on Saturday 2nd March, 2019 and expected to end in 30 days. 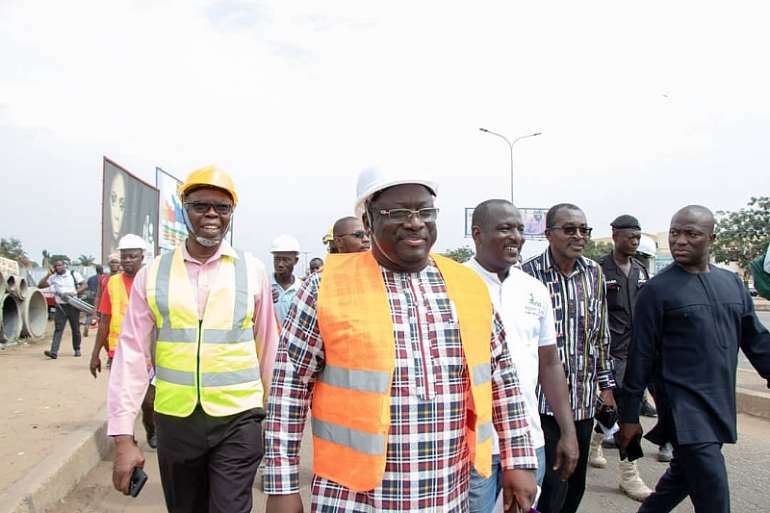 Addressing the media at the project site, the Mayor of Accra, Mohammed Adjei Sowah said the project is in fulfillment of President Akufo-Addo’s vision of making Accra the cleanest city in Africa. “As part of President Akufo-Addo’s call to reduce the flooding and make Accra a resilient city, we have identified flood prone areas of which Government through funding support from the World Bank under the Greater Accra Metropolitan Area (GAMA) to construct bigger drains to hold a lot water and reduce flooding,” he stated. The Mayor noted that the first light junction has become a challenge for motorists during rainy seasons mainly due to the heavy flow of water from the bigger drain upstream. 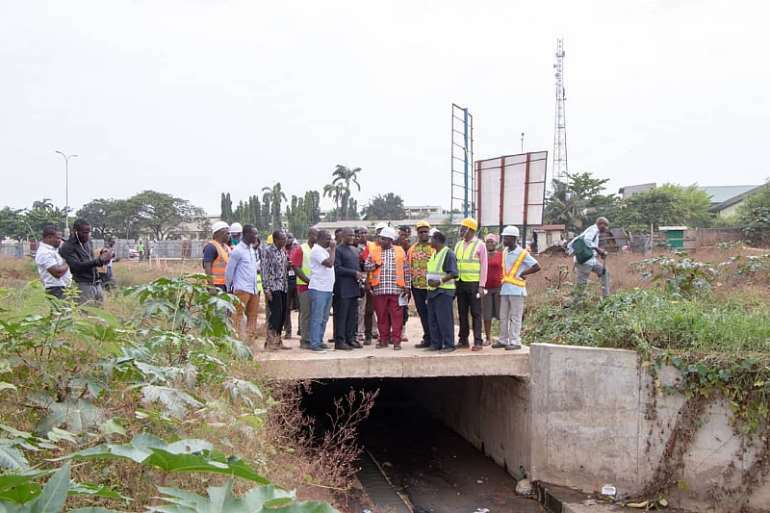 Mr. Sowah indicated that the size of the underground drain is narrow and unable to absorb the large volume of water which flows through the roadside drain. According to him, the excesses from the heavy flow cause it to overflow and spill as a result of the pressure at the intersection. The frequent spillage, he said accounts for the perennial flooding at Kaneshie First light and the surrounding areas. 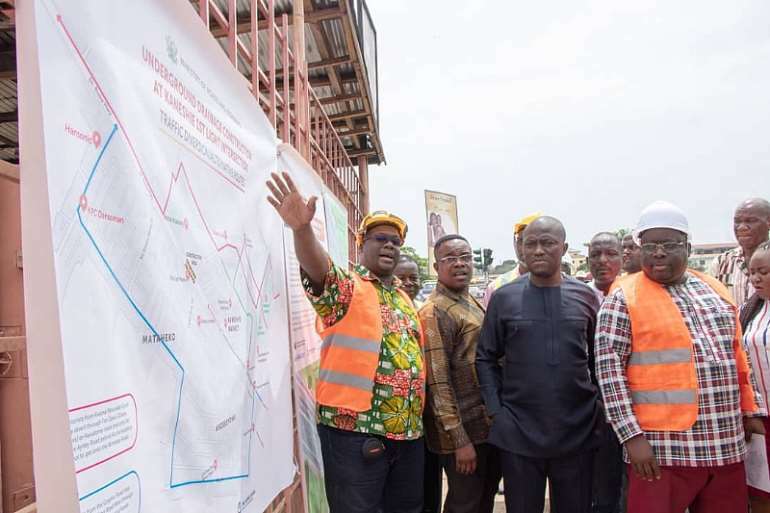 He stressed that the project when completed will ease the flow of water from Bubuashie, Darkuman and Odorkor through the 4meter wide roadside drain linking the same size (4meter wide) underground drain. The Mayor is optimistic the expansion of the underground drainage will bring relief to motorists, residents and shop owners. 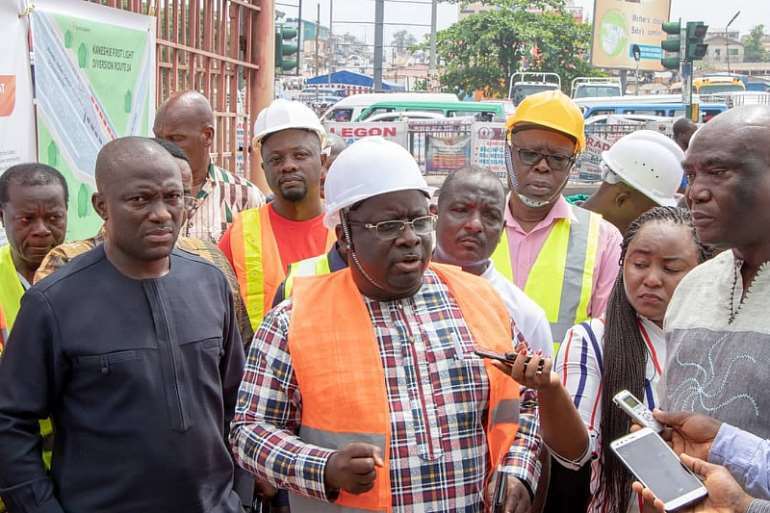 According to him, all the major drains within the flood prone areas in the Metropolis will be constructed between the period of 2years to address flooding in the city. 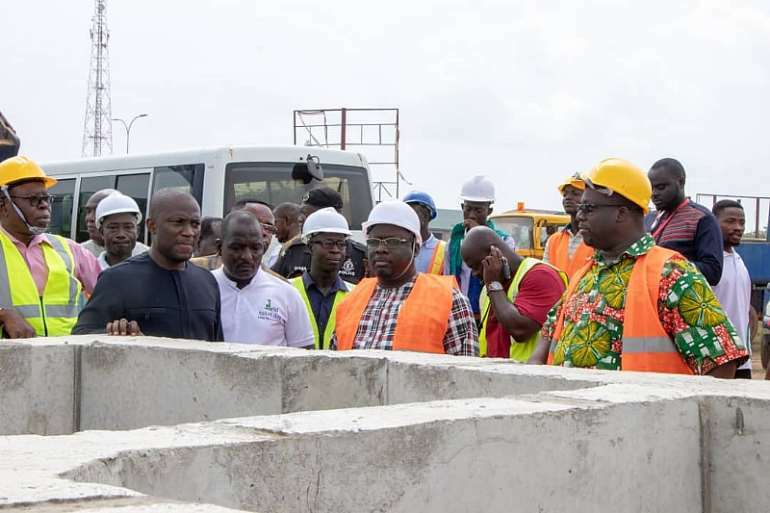 He added that the Ministry of Works and Housing has also awarded contracts for construction of many storm drains to commence next week at Baale, Industrial Area, South Odorkor and many areas. “These are all defective drains or drains that were constructed in the pre-colonial time and are no more serving its usefulness,” Mr. Sowa intimated. 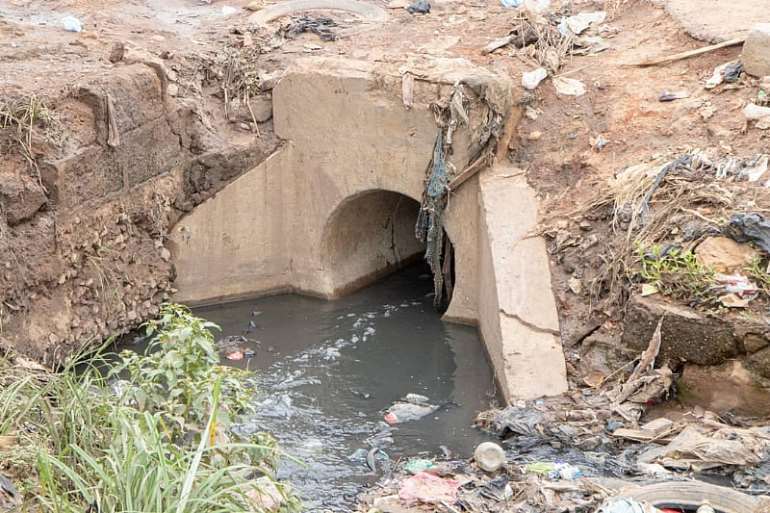 In environmental care, the Mayor posited that maintenance of drains is critical and as such, about 520meters of the 600meter drain will be covered and fixed with metal sieve to block plastic wastes and debris from sneaking through the drain. The remaining 80meters, according to him, will provide space for the scooping of the silt and wastes to ease the flow of water. He added that a metal fence will be constructed around the Accra Academy School to prevent human contact with the drain and to address the menace of open defecation in gutters. Ing. 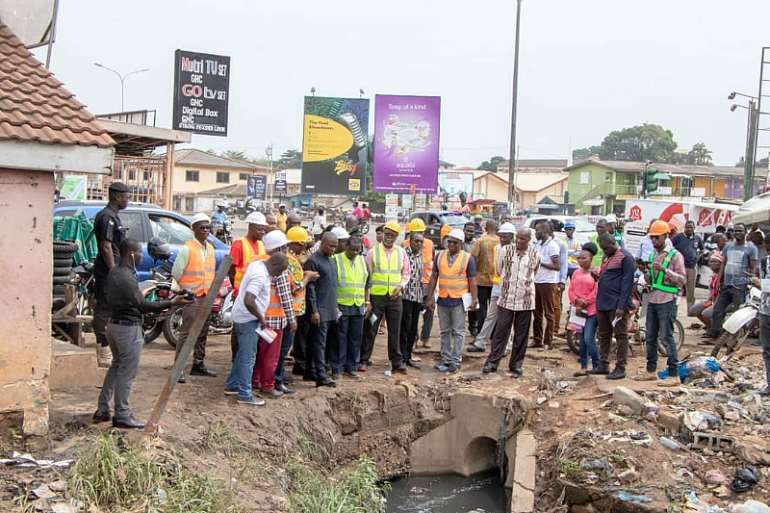 George Asiedu, Project Coordinator, GAMA Sanitation and Water Project said the project will significantly expand the drainage system to ease the flow of water from the Obetsebi Lamptey roundabout, Kaneshie market and the surrounding areas. He emphasized that the construction of the drain will also help reduce the impact of the flooding at the Accra Academy campus. “Kaneshie first Light as you know has been experiencing perennial flooding mainly because the Darkuman and Bubuashie drainage converges into the Kaneshie drain which passes through Accra Academy and as a result cause overflow. When the water get to this section, it has to be directed into the Kaneshie underground drain which is at the center of the first light road. That is exactly where the problem causing the flooding in this area. “We have put in a place a 4meter wide (1.6meter deep) and channelized for 600meter to the first light section. What we need to do is to be able to create an inlet into the existing drainage beneath the road. Once we are able to direct the water from here, we will be able to take a chunk of the flow from the roadside drainage into the existing underground drainage which is located beneath the middle of the road. That will significantly reduce the backflow effect that has been causing the flooding in this area,” Ing. George Asiedu emphasised. He added that other contributory factors that may have been part of the cause of the perennial flooding will be addressed. Ing. 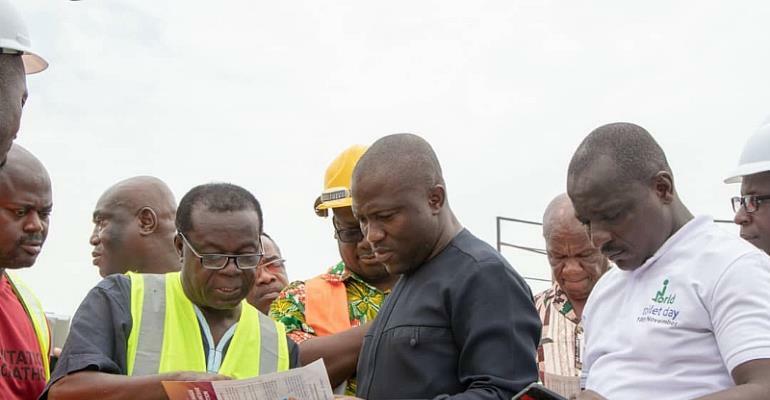 George Asiedu, intimated that several alternative routes have been proposed for motorists to ease the traffic on the Kaneshie Winneba road. 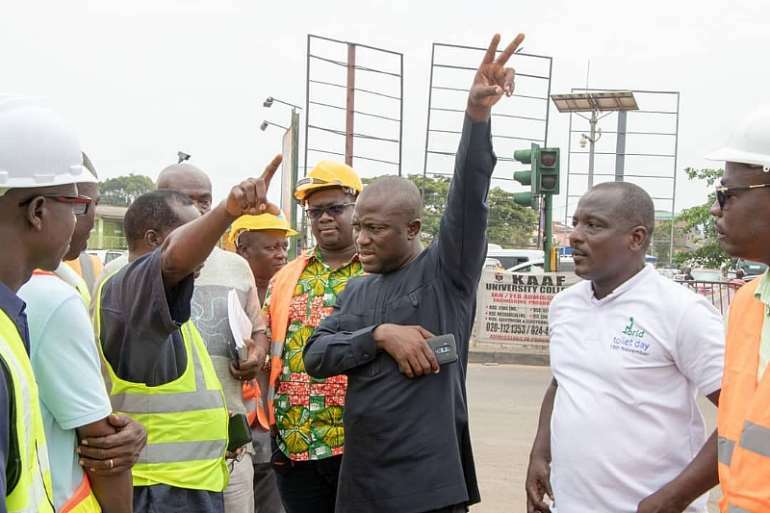 The Sanitary Engineer of GAMA under the Ministry of Sanitation and Water Resources, Gabriel Engmann stressed that motorists from Kwame Nkrumah circle may divert through Feo Oyeo (Ghanaian Times) or Awudome roads and onto Nii Asere Ayitey road behind Accra Academy School to get onto the Winneba road. 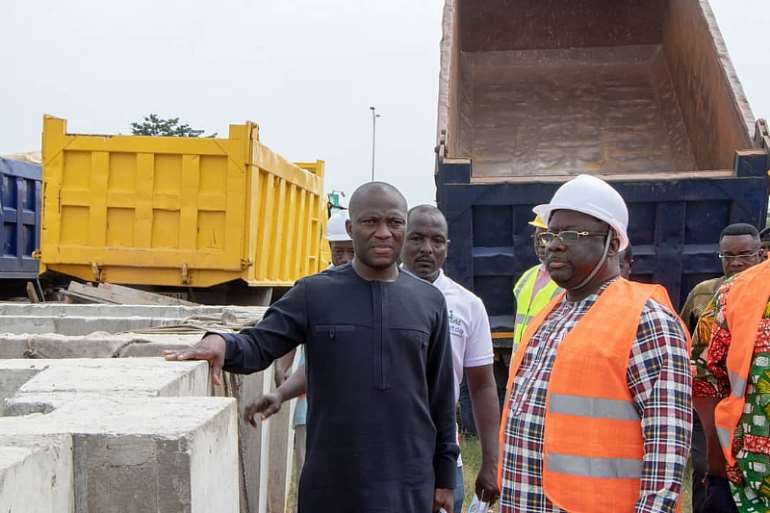 He added that motorists from Kaneshie Pamprom area may divert through Nii Teiko Din, Awudome road and other connecting roads onto the Winneba road. According to him, motorists from the Graphic road may divert onto the Ring Road West through Oblogo and other concerning roads onto the Winneba road. Mr. Engmann stated that the public, motorists and pedestrians approaching the construction site are advised to take note of the diversion signs and all other traffic management measures for maximum co-operation. The Government of Ghana jointly through the Ministry of Works and Housing, Ministry of Sanitation and Water Resources, Ministry of Inner City and Zongo Development, and Ministry of Local Government and Rural Development is preparing to implement the Greater Accra Resilient and Integrated Development Project (GARID), with funding from the World Bank. 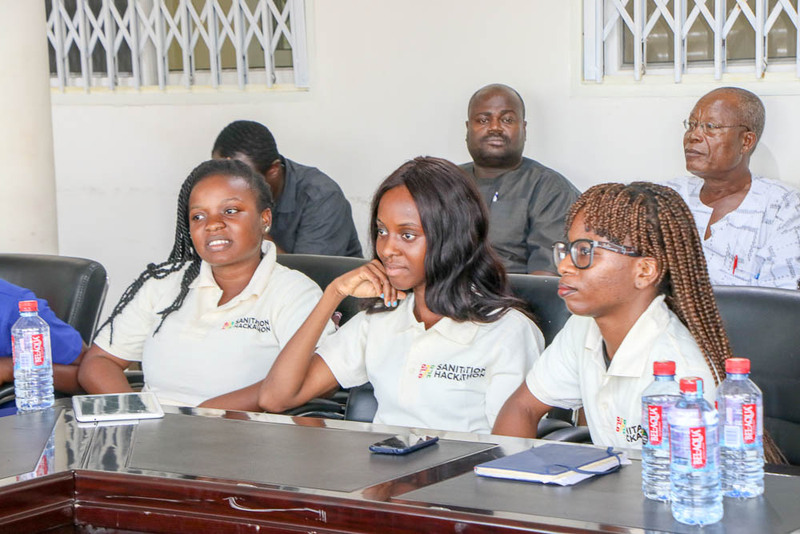 The project’s objective is improving flood and solid waste management, and the provision of public services to targeted communities within the Odaw Basin of Greater Accra Region. One of the major activities under the project is the periodic dredging of the Odaw channel. Total volume to be dredged is estimated about 1 million m3. Caprice-Abossay Okai bridge: Lined section of Odaw River channel with high sedimentation rates and the most frequently flooded area. 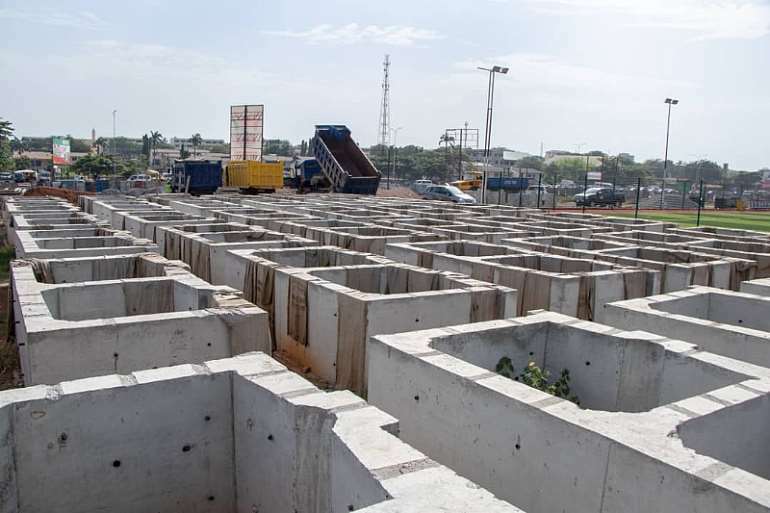 Abossey-Okai bridge – Interception weir:Wider unlined section of the Odaw with fixed banks. The section runs through waste disposal areas and a large informal settlement called Old Fadema. Interception weir-Sea: “Korle Lagoon” Area. Main Odaw River tributaries: South Kaneshie (including Cemetary drain and Mataheko drain), Nima drain and Agbogbloshie drain. A detailed feasibility and design study will precede the dredging. In compliance with the Environmental Assessment Regulations of 1999 (LI 1652) and the World Bank Policy on Involuntary Resettlement (OP 4.12), the Ministry of Works and Housing has commissioned the preparation of an Environmental and Social Impact Study (ESIA) to address and mitigate the potential social and economic impacts of the project. The ESIA has outlined the adverse potential impacts of the dredging and proposed remedial measures. Ministry of Inner City and Zongo Development, Accra. This Public Disclosure Notice is also posted on the Public Notice Boards of the Ministry of Works and housing. The document will also be disclosed electronically on the external website of the World Bank. 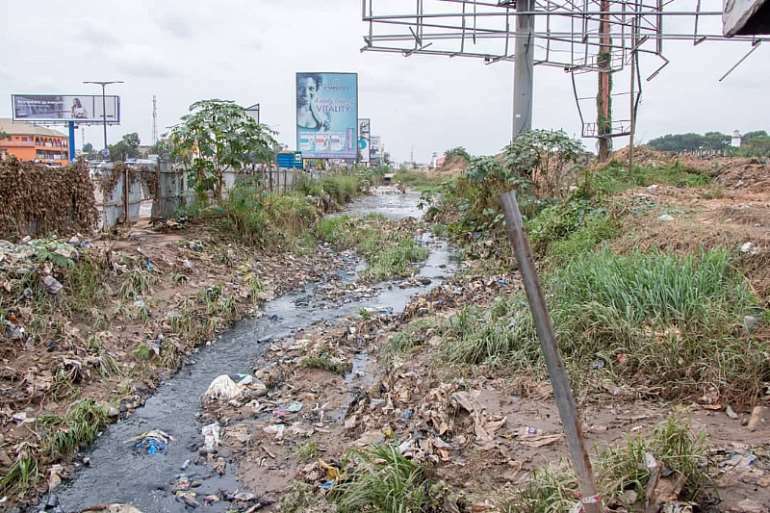 Among the Project components is investments to rehabilitate and cover major dumpsites in Greater Accra Metropolitan Area and provide aftercare management of collection and treatment of leachate to prevent further pollution of the Odaw. 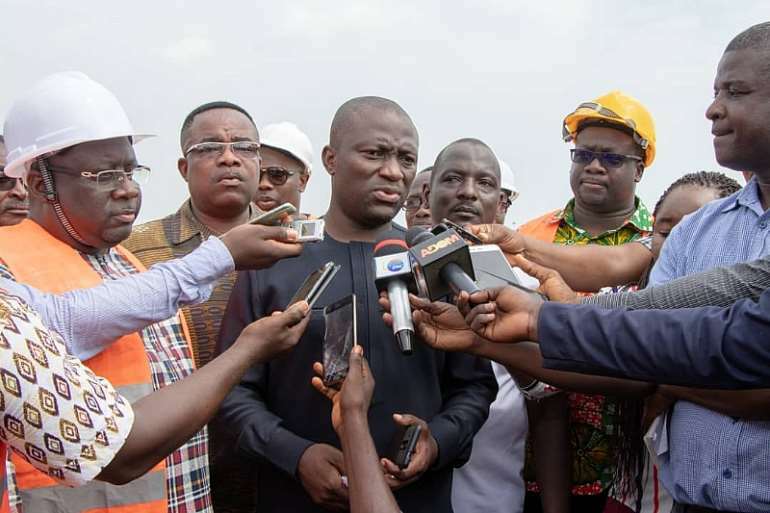 In this connection, the Ministry of Sanitation and Water Resources, in consultation with the Ga East Municipal Assembly (GEMA) has selected the Abloragyei solid waste dump for rehabilitation, closure and aftercare management to prevent further leachate and waste pollution of the Dakobi stream that discharges into the Odaw channel. Installing gas collection pipe vents. Post-cap end use of the area for recreational purposes. In compliance with the Environmental Assessment Regulations of 1999 (LI 1652) and the World Bank Policy on Involuntary Resettlement (OP 4.12), the Ministry of Works and Housing has commissioned the preparation of an Abbreviated Resettlement Plan (ARAP) to address and mitigate the potential social and economic impacts of the project on the affected persons, which report has been completed. The ARAP report among others outlined the adverse potential impacts on the project affected persons that are associated with the proposed rehabilitation, closure and aftercare management operations; the applicable legal and administrative framework for compensation and resettlement related issues, baseline characteristics of the project area, census and socio-economic condition of Project Affected Persons, eligibility criteria and entitlements, consultations and an implementation plan for the ARAP. Also included are measures to identify and resolve grievances at the project communities in a fair, transparent and prompt manner. This Public Disclosure Notice is also posted on the Public Notice Boards of the Ga East Municipal Assembly, Abokobi and the project communities. The Sanitation and Water Resources Ministry has announced that it will soon replicate the GAMA Water and Sanitation Project to other parts of the country. The proposed up-scaling follows huge strides recorded in the implementation of the pro-poor project in the Greater Accra Region. GAMA, through the World Bank is expected to provide nineteen thousand, one hundred affordable, environmental friendly state of the art toilet facilities to low income and urban communities and expand access to potable water to these areas by 2020. The World Vision International estimates that about 15 in every 100 Ghanaians have access to sanitation facilities and services, while nearly all public schools lack access to improved sanitation and hygiene facilities. So far, more that fifteen thousand four hundred toilets have been constructed for households in various assemblies within the catchment area for the ongoing Greater Accra Metropolitan Water and Sanitation Project. This figure according to project managers is subject to change considering the rate with which contractors are constructing the facilities based on the increasing demand. Liquid Waste Programs Manager, Henrietta Osei-Tutu hinted “once you start the initiative in other areas, it means that all the resources required, both human and financial has to be in place, and it takes time to mobilize these things.” The leader for the capacity building component of the GAMA Water and Sanitation project added “GAMA has given us so many lessons through the capacity building component which is helping us draw lessons so that when we move to other areas we will not repeat some of the draw backs recorded in GAMA. 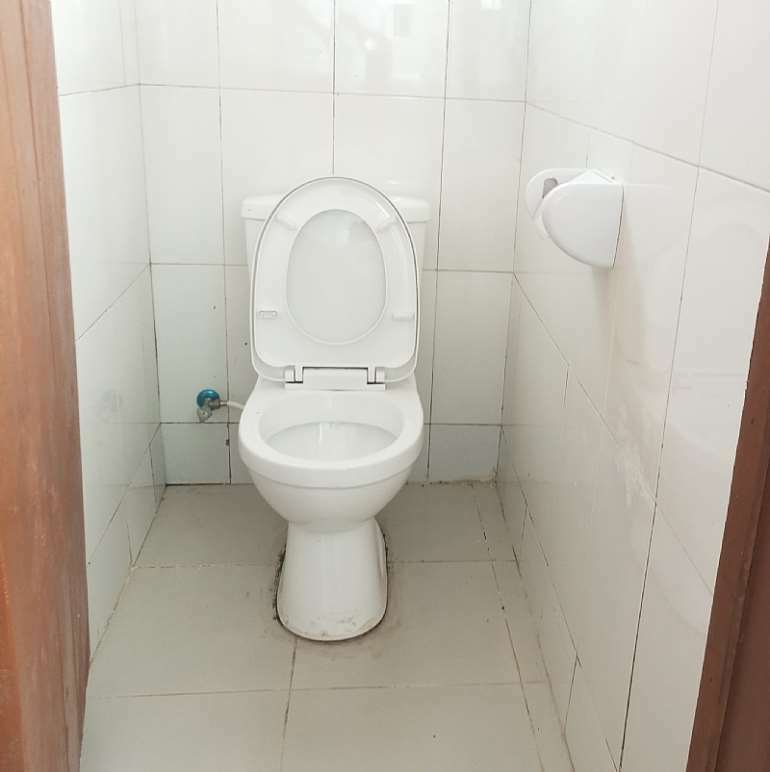 Managers of the Greater Accra Metropolitan Assembly Water and Sanitation Project say figures available to them as at December 19, 2018 points to the successful completion of more than 15,400 household toilets. The project has also completed a total of 106 out of proposed 400 education institutional toilets to be provided more than in over 100 schools across the project catchment area. More so, the water component of the project according to Henrietta Osei-Tutu “has even a better story than the sanitation component.” “With the sanitation component, we had to do a lot of studies, assessments and pilots before we were able to scale up to achieve the success we have”, she revealed. The Liquid Waste Programs Manager at the Sanitation Ministry added “the water component on the other hand was quite specific. They started out mainly with their initiative which was the construction and extension of pipe mains for houses to be able to connect in low income areas especially where the mains which are the bigger pipes that distribute water were not passing through.” The water component is said to have exceeded its target, connecting areas that hitherto had serious water challenges like Adenta. The project is currently in Ga East where suburbs like Taifa, Kwabenya and the like have access to potable water now. Like most public facilities, the poor maintenance culture is thwarting efforts by the GAMA project to provide decent toilet facilities for schools. 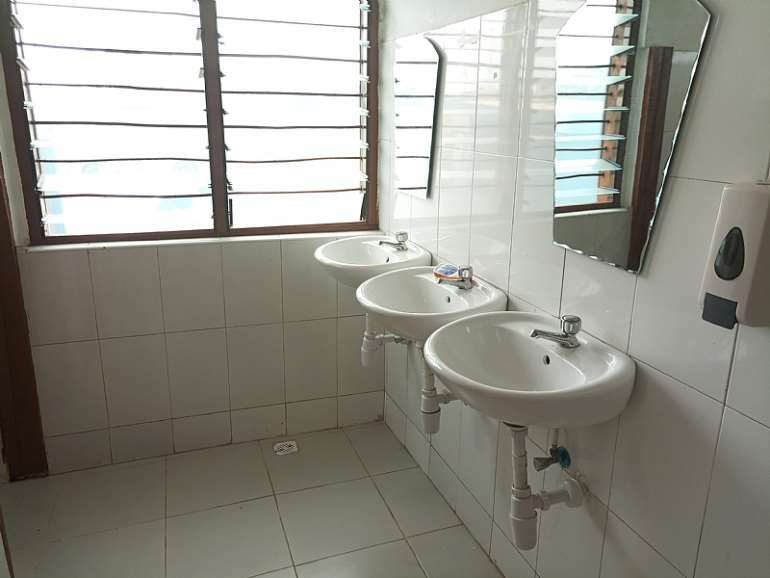 A good number of the completed school toilets according to project managers are in bad shape owing to the poor maintenance culture and seeming lake of concern by district and municipal assembly officers to keep the facilities functioning the way it ought to. Solid Waste Programs Manager at the Sanitation Ministry, Charlotte Adjei-Marfo noted “the figures and reports we have on assessments of school toilets are very disturbing. The management of the ones we have built has been a big issue and it is the responsibility of the municipal assemblies to cater for the toilets through budgetary allocations from the assemblies”. 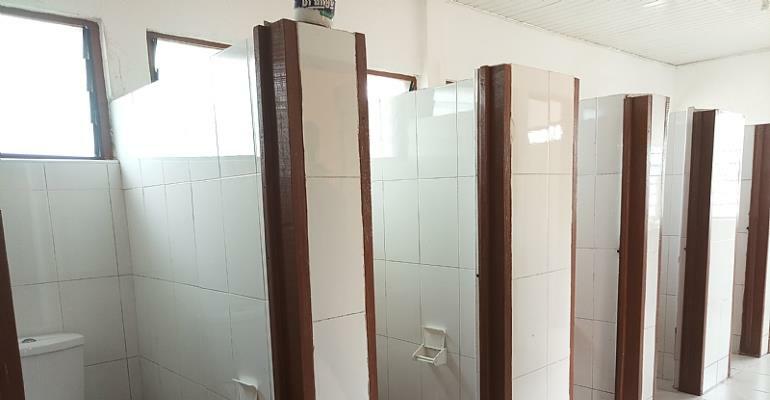 Behavioral Change Specialist working on the GAMA project, Quaranchie Adama-Tettey revealed that GAMA would soon come up with a district league table for schools on the management of their toilet facilities. He said “the school within the GAMA area would be encouraged to come up with sustainable ways of managing their school toilets, not just ways but how they are doing it and succeeding. This would help us award marks and recognize the schools that are doing well in that regard”. GAMA is deploying the Bio-digester Toilet System which is an on-site treatment system for faecal matter. The technology replaces the septic tank by receiving and treating faecal matter directly from the water closets. More than 90% of beneficiary households have had the technology installed with the toilet constructed for them. Behavioral Change Specialist working on the GAMA project, Quaranchie Adama-Tettey maintains s“the bio-digester technology has become useful because it is small, much more affordable and can be constructed in very clumsy areas”. He however adds that “we are aware that people are constructing this bio-digester toilets without the requisite skills and knowledge on how to construct them, so as a project, because we have made the bio-digester technology popular, we do not want to leave it at that. We want to go further into developing guidelines that somebody can pick up to be able to follow to properly construct the bio-digester toilets and also do them well”. Mr Tettey said they will engage private sector to also develop the service chain for the technology to create a business model for people to engage and benefit from. The GAMA Water and Sanitation Project is hoping to get additional funding next year to facilitate the construction of more storm drains and also undertake an upstream and downstream extension of the Mallam drain. This is aimed at helping address perennial flooding in the capital. 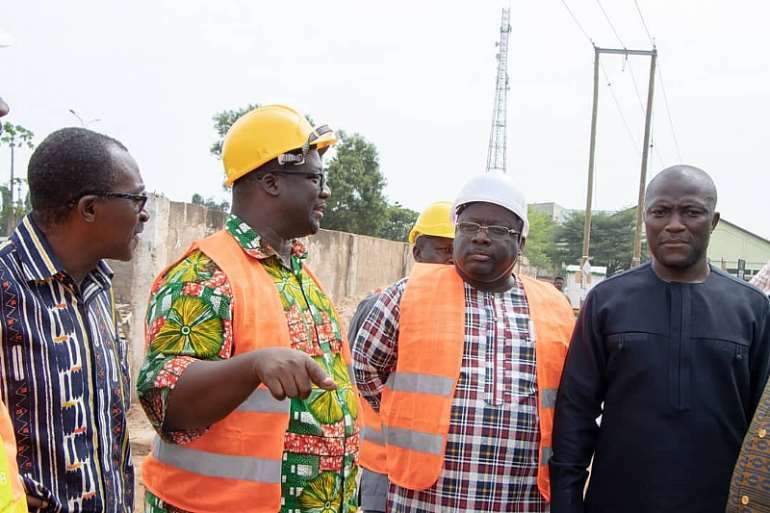 The Project managers are also seeking to work to improve sewerage systems by major giving attention to the Teshie Treatment Plant and Tema Sewerage System. Government through the Ministry of Sanitation has extended the coverage of potable water to over a thousand communities across the country. The project, targeted primarily at addressing the potable water demand and supply challenges in rural areas of the country was signed between the Government of Ghana under the erstwhile administration and China. The $20 million projects awarded to Jiangxi Zhongmei Engineering Construction Company Limited will provide safe drinking water to rural communities and small villages in all the 10 regions. A total of one thousand and twenty-nine boreholes were constructed over the three year period. 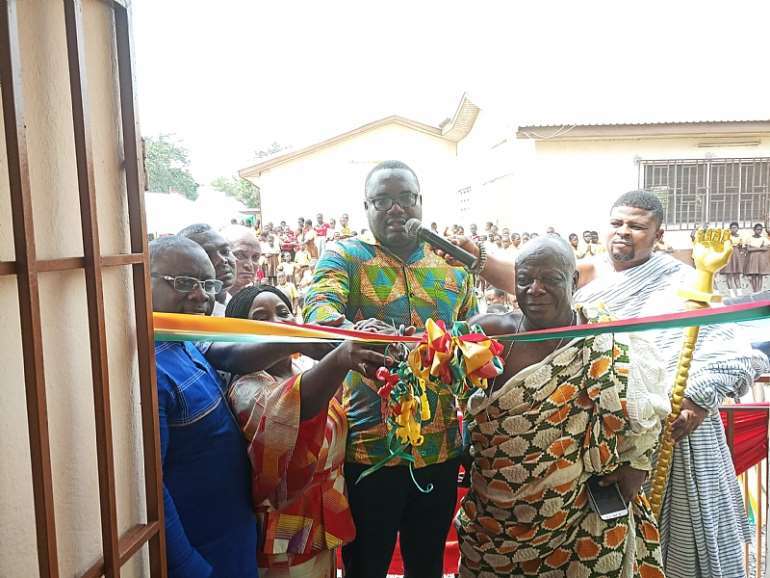 Out of that, fifty-two were fitted with electric pumps, nine hundred and seventy-six fitted with hand pumps and the remaining with solar power at Asante Akyem North in the Ashanti Region. An estimated number of five hundred thousand people or more are said to benefit from the entire project which consolidates efforts by government to ensure access to water for all and eliminate health complications that come with consumption of unwholesome water. Minister for Sanitation and Water Resources, Cecilia Abena-Dapaah told a gathering at the handing over ceremony in Densuso in the Eastern Region the project enables Ghana to push for the fulfillment of the Sustainable Development Goal 6 (SDG6). “All these and many others are part of the larger systems and structural reorganization of the WASH Sector aligned with new thinking required by the Sustainable Development Goal 6 which seeks to ensure sustainable management of water, sanitation, and hygiene for all by 2030,” she said. China’s Ambassador to Ghana on his part said China and Ghana actively explore cooperation in sanitation infrastructure, water pollution control among other vital areas of national concern. Shi Ting Wang added that China ranked first in Ghana’s investment projects with trade between the two countries fast rising. “In recent years, China-Ghana friendship has been continuously strengthened, and the corporation between the two countries has yielded fruitful results. Particularly, President Akufo Addo paid a State visit to China in September last year to participate in the Beijing Summit, pushing bilateral relations to a higher level,” he said. The Ambassador added “Trade between our countries developed rapidly, from January to November 2018, the bilateral trade volume exceeded US$6.5 billion, of which Ghana’s exports to China reached US$2.18 billion, about 30% increase year-on-year basis”. He told the durbar to hand over the boreholes that China will focus on eight major initiatives of industrial promotion, facility connectivity, trade facilitation, green development, capacity building, health and hygiene, humanities exchange, and peace and security with African countries including Ghana in the next three years. The government appears bent on using innovative approaches in addressing the sanitation situation in the country as it has project seed funding of ten thousand dollars for some youth as they apply ICT solutions to sanitation challenges. 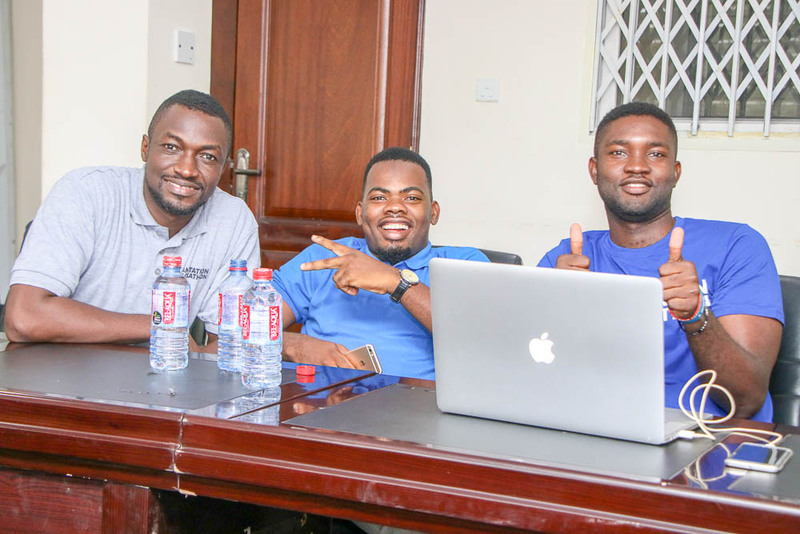 Earlier in November, the Ministry for Sanitation and Water Resources through its Greater Accra Metropolitan Assembly (GAMA) Sanitation and Water Project in partnership with the World Bank had launched a Sanitation Hackathon which brought together IT professionals to develop a technological solution to problems within a specific timeline. After over a thousand applications, some three hundred where shortlisted. 35 teams where subsequently drawn to compete for the funding. 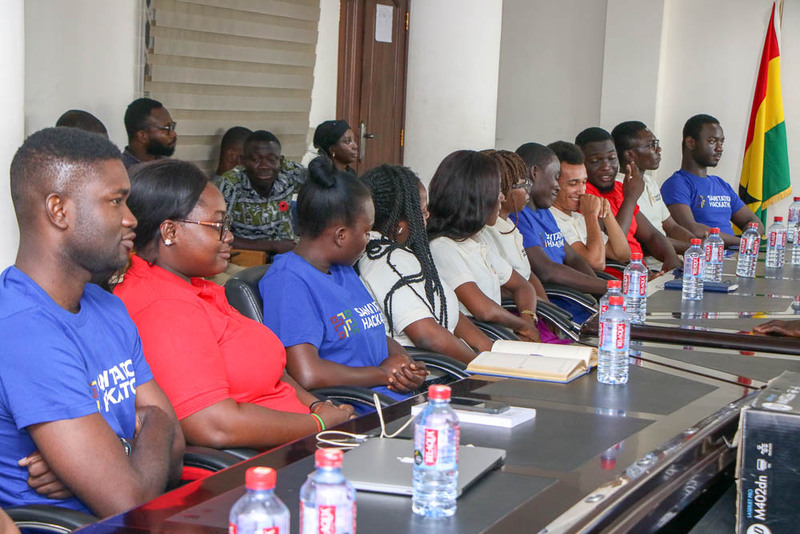 The 3-day event had contestants camped for three days as they worked nonstop brainstorming and developing solutions that would help fix the many sanitation issues that constantly bedevil the country. 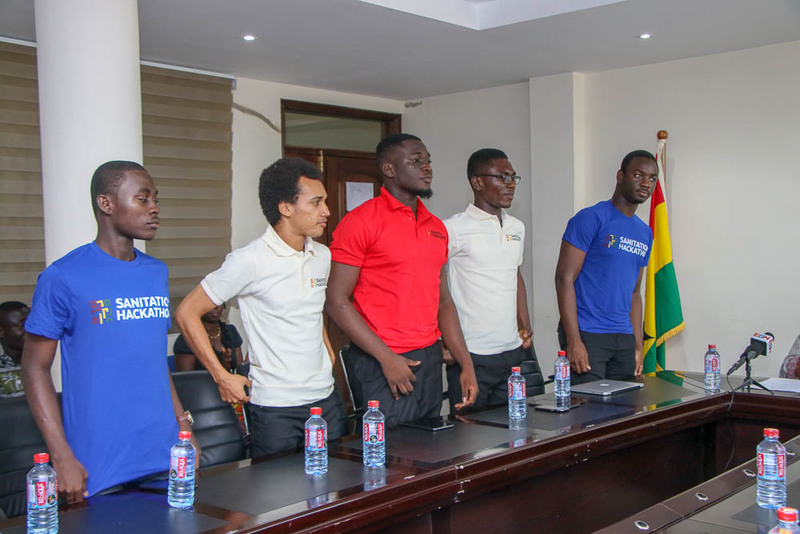 At the end of the event the NsuApp team came out first with their business model that seeks to use funds generated from the sale of packaged water to fund the recycling of its plastic by-product. They were followed by the Beamers, an online sanitation advocacy and education platform and then finally SaniGh who worked on a Liquid Waste service tool that updates households on the level of slug in their septic tanks. 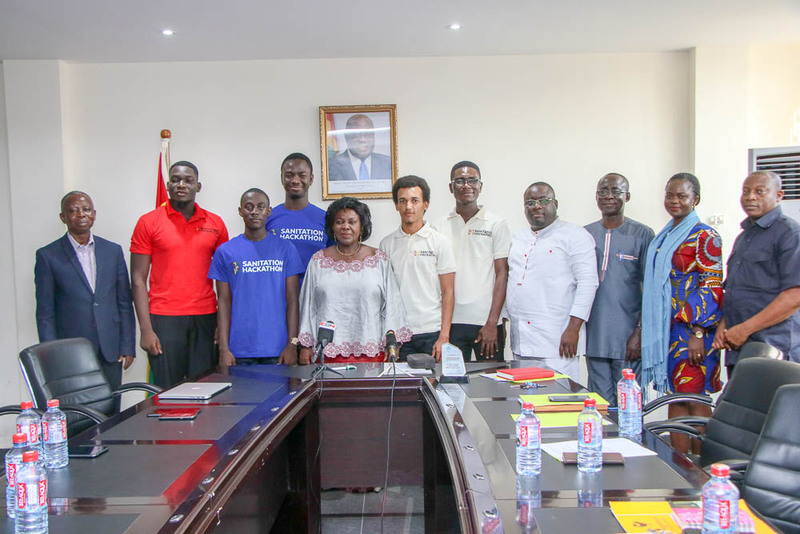 During a courtesy call by the winning teams at the office of the Minister for Sanitation and Water Resources, Cecilia Dapaah, she indicated that the government is committed to empowering the youth in the country. The GAMA Sanitation and Water Project is $150 million sponsorship by the World Bank with the collaboration of the Ministry of Sanitation and Water Resources to help lower income level communities to have access to affordable toilet and water facilities. Presently over 13,000 household toilets have been constructed since 2014 and the project is currently ranked as highly successful by the World Bank. The Greater Accra Metropolitan Area Sanitation and Water Project (GAMA-SWP) has succeeded at reaching averagely 1,100 homes, monthly, with toilet facilities in about 11 municipal areas. The project also targeting 200,000 pupils has constructed and rehabilitated toilet facilities for over 234 schools in 21 municipalities. The 150 million dollars grant provided by the World Bank is aimed at supporting low income urban communities in Metropolitan, Municipal and District Assemblies (MMDAs) in the Greater Accra Region to have access to improved sanitation and water supply. Kwadwo Antwi Gyasi, Sanitation Engineer, GAMA said his team had to package the process, package the system to make sanitation attractive to make investors come to invest in. “So we did that and we were able to meet the demand and that is one of the contributing factors in us reaching such high numbers. 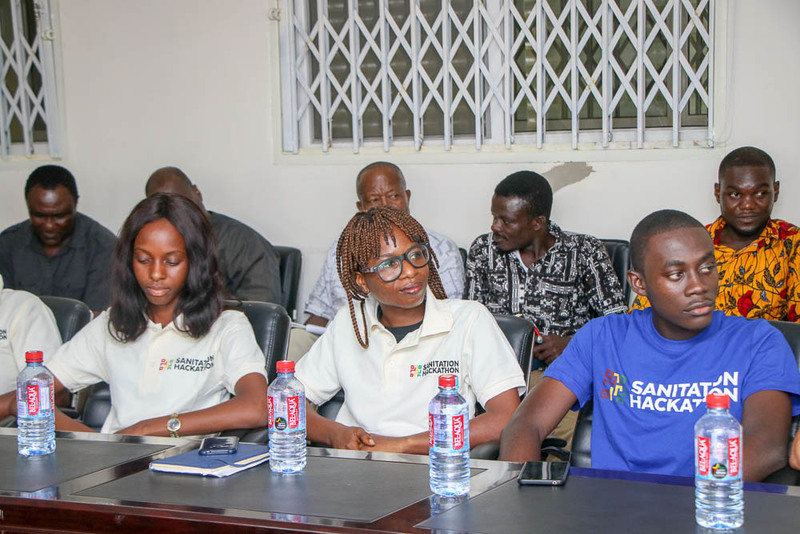 After laying a very strong foundation, we had to boost our supply,” he said at a meeting with the Media Coalition against Open Defecation (M-Code) in Accra. He explained that for the project, municipal assemblies are the main implementing agencies, where the project unit is providing technical supervisory role. “So if you want a toilet facility you go to the municipal assembly. What we’ve done with the municipal assembly is to empower them to perform their duties, and normally they are supposed to ensure that their citizens have household toilets, and we have been able to do that. Ga West is leading with over 2600 toilet facilities, with LADMA at the bottom with about 570, which are figures from 2016 till date. We map all toilet facilities with GPS positions for monitoring and maintenance purposes,” he said. Mr Gyasi revealed that the Sanitation Ministry is in a process of standardizing construction of bio-digesters by developing a national construction manual that will guide the construction of bio-digesters which will be followed by nationwide trainings and certification. Dr Doris Yaa Dartey, Patron of M-Code called on stakeholders and citizens to bring an end to open defecation as she describes it as a matter of national disgrace.“Yes, this is a matter of national emergency. We also urge individuals across the length and breadth of our country who defecate in the open to change their attitudes and feel the shame. It does not make any sense that some homes provide kitchens but ignore the outcome of the digestive system,” she said. 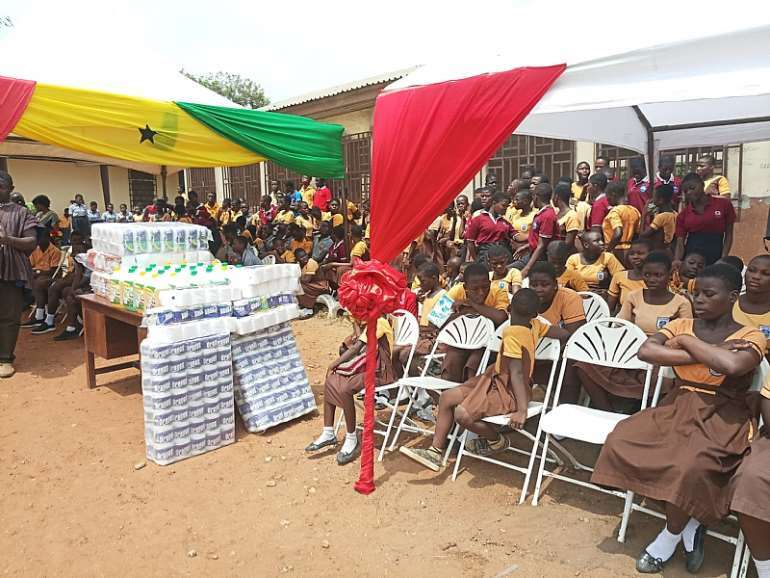 The Greater Accra Metropolitan Area-Sanitation and Water project (GAMA) has presented 17 institutional toilets to public schools in the Tema Metropolis. The remaining six of the 23 institutional toilets for the metropolis are pending waiting to be completed to reach out to the other schools. The disability friendly facilities come with changing rooms for females to increase girl-child school attendance during menstrual periods, smart flush water closet, hand washing basin, mirror, liquid soap dispenser, overhead water storage facilities, compost pit and bin bay for refuse segregation. 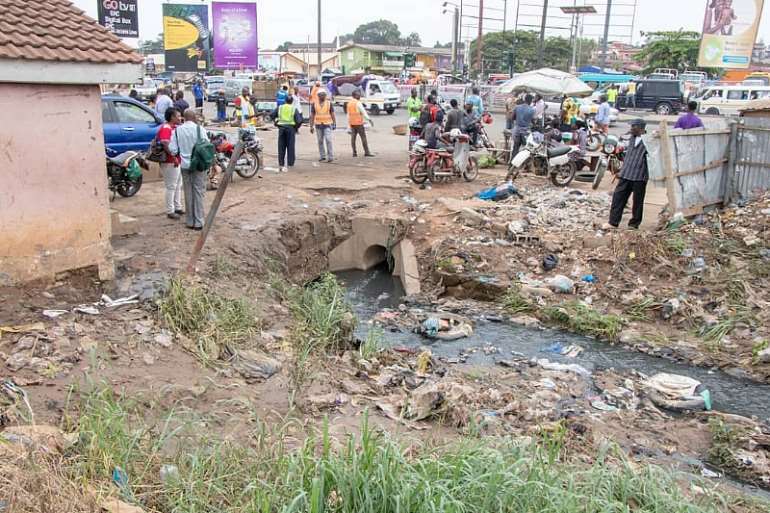 Speaking at the ceremony in Tema, the Metropolitan Chief Executive (MCE) of the Tema Metropolitan Assembly (TMA), Felix Mensah Nii Anang-La said poor sanitation in the metropolis has become a nightmare for them as they find themselves inundated with the problem. He noted that GAMA’s project resonates well with the sanitation component of the Assembly’s restoration agenda to make the metropolis very conducive and healthy for living. 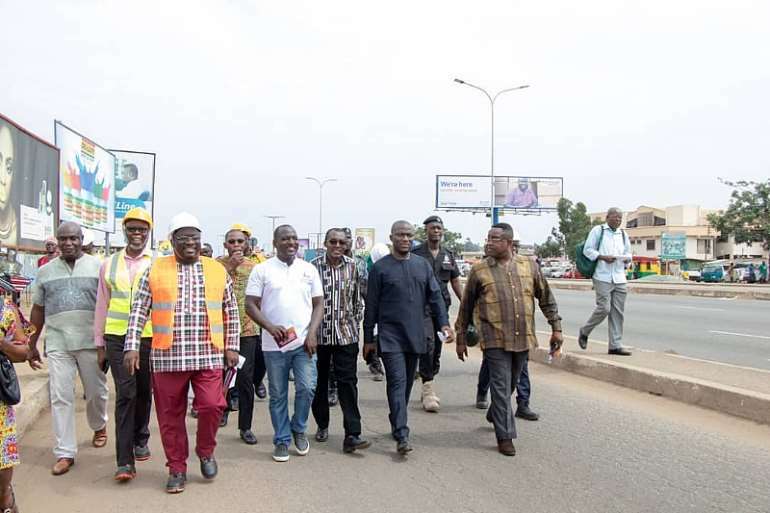 The MCE indicated that the Metropolis which until recently encompassed Tema West Municipality benefited from 35 institutional toilets under the GAMA project. He added that with the creation of Tema West Municipal Assembly, TMA now benefits from 23 institutional toilets of which 17 has been completed. 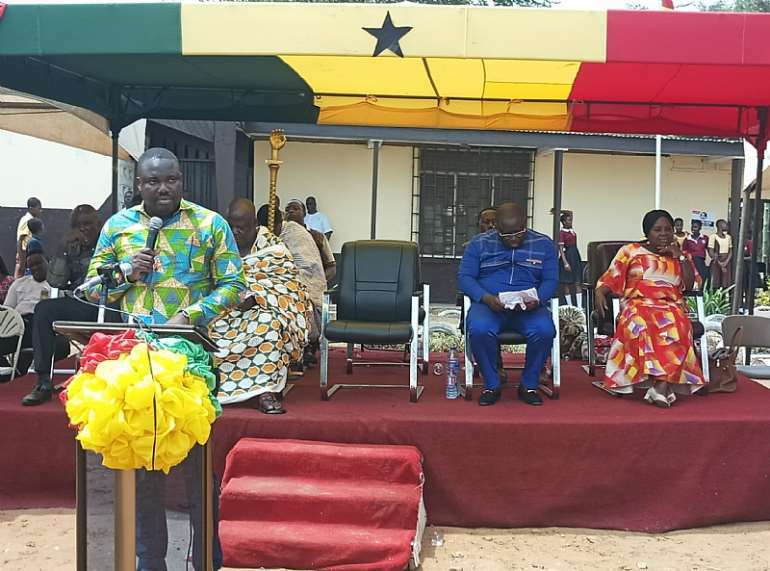 Mr. Felix Mensah Nii Anang-La called for urgent steps to properly orient the school children on the proper use of these facilities in order to keep it clean at all times. The Metro Director of Education, Mrs. Margaret Nsiah-Asamoah noted that the facilities will help improve teaching and learning among teachers and school children. She added that the facility which provides a convenient place for schools girls during their menstrual cycle could curb absenteeism. Mrs. Nsiah-Asamoah urges the assembly members, School Management Committees, Parent and Teachers Association to jealously guard the facilities from being used by community members. The GAMA Coordinator for the Tema Metropolis, Mrs. Bertha Essel emphasized that apart from the institutional toilets, 2300 household toilets have been constructed in the Tema Metropolis. She stressed that two 1.5km drains have been completed out of the total of four selected at various locations in the Metropolis. According to her, a toilet jama group have been selected to compose innovative sanitation behavioral change songs to sensitize communities about sanitation and hygiene in low-income communities. She concluded that the development objective of the GAMA sanitation and Water Project for Ghana was to increase access to improved sanitation and water supply in GAMA to low income communities.